Finally I have good celeriac – fat, heavy balls of gnarled roots – and I am proud. 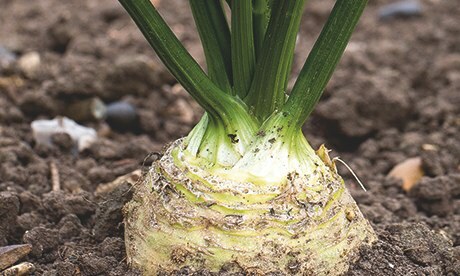 Celeriac is a close cousin of celery, with a swollen base; a turnip-rooted celery, if you like. It is a decidedly ugly vegetable, with fiddly roots coming off its distended mass. It’s a strange pale colour, too, which shows up every stain and hidden crack of dirt. Once peeled, it browns very quickly, so drop it into acidulated water to stop it oxidising. But beneath all this is something very special. It has all its cousin’s clean, citrus-like taste, but is sweet and earthy, too. Shredded in a rémoulade, blended into a soup or pureed into mash, it is a princely dish for winter. However, it is tricky to grow. This year I tried the variety ‘Giant Prague’, which I think accounts a great deal for my success: giant it is. ‘Prinz’ is also worth trying. Start it off very early. I sow at the end of February and again in March. I have never had much success sowing direct. Celeriac needs heat to germinate; a heated propagator or sunny windowsill is best. Don’t cover the seed: it needs light to germinate. Slugs are partial to the young foliage; bitter experience has taught me to sow extras. What seems like a small forest on the kitchen windowsill is quickly reduced by slugs outside. Celeriac likes a hot summer, which is why I’m boasting this year. If you are farther north, lack of heat will be a problem, but you can grow good celeriac in polytunnels. It will tolerate light shade. It also likes very damp conditions, and for fat bases you need to water and mulch. I kept a regular pattern of grass clippings and old straw going all summer, with evening soaks between new layers. A weekly feed with liquid manure from early summer onwards won’t go amiss. As you go into autumn, it’s worth pulling off any ageing leaves; these tend to flop out and lie on the ground, harbouring slugs. This also exposes the swelling roots to late rays of sun. By the end of October, start mulching with straw, bracken or similar material, because frost can damage the skin and slugs will move in. Celery leaf miner (the celery fly with crazy green eyes) tunnels into the leaves and causes blisters, slowing growth. Destroy infected leaves and cover with a fine netting. A decent-sized bulb should be able to survive –10C under a thick layer of insulation, though cover with fleece or fine mesh in heavy snow. The leaves stay green most winters and can be used in soups and stews as a celery substitute, but go easy, because they are distinctly more flavoursome.